At a time when supposedly responsible filmmakers are glorifying gangsters terrorists and sociopaths in ostensible bio-pics Soorma about the struggles of hockey champ Sandeep Singh to overcome crippling obstacles to claim a name among sports legends comes as a gust of unpolluted air. This is a film that needed to be made a story about a man whom future generations need to know about and look up to. Damn the young need role models from our everyday life not imported super-heroes who can t save their own egos even as they purport to save civilization from destruction. 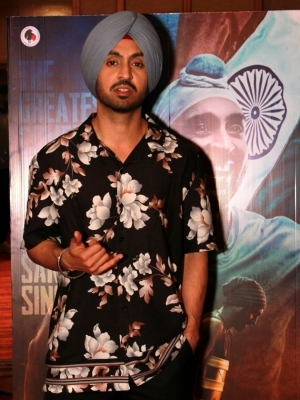 Soorma serves up an appetizing homemade dish of inspirational drama and some beautifully furtive flights of flirtation where Diljit Dosanjh s Sandeep Singh courts Tapsee Pannu s Harpreet with hockey and love songs. There is a resonant ring of authenticity to the courtship as though director Shaad Ali were addressing love not as a second-hand emotion but a first-hand dip into emotions that are so real and pure they make us smile. A lot of the time Shaad s narrative deploys the standards sports tropes: protagonist undertaking punishing regiment cruel coach and gruelling tasks for the hero savage setbacks and those inspiring songs about akela-chala-chal (very cutely redolent in Gulzar s poetry). These stereotypical signposts of sportive cinema are sprinkled into Sandeep Singh s life-story with inspiring gusto. Shaad Ali films Sandeep Singh s story with tremendous empathy. There are no attempts to titivate the tale with an august aura or make the characters more appealing than they really are. It is the narrative s good fortune that it gets the actors it deserves. Not just Diljit Dosanjh who simply takes charge of Sandeep Singh s character with pride and affection but the rest of cast who huddle together in a circle of shared kinship that moved me to tears specially when Sandeep is wounded by a near-fatal gunshot. There is a sequence where a man kindly inquires about Sandeep s health and Sandeep s father (played with contagious compassion by Satish Kaushik) looks so forlorn for a few minutes he becomes every disappointed father who ever dreams of seeing his child conquer the world. Angad Bedi as Sandeep s Veerji is also splendid. Physically and emotionally potent Angad makes the supportive sibling s part look so real you wish you could take him home to be your real-life bro. Vijay Raaz as Sandeep s Bihari coach reins in his emotions with expertise. Tapsee Pannu as the hockey player who is wooed by Sandeep Singh has seldom looked so pretty.She lends emotional heft to the film s second-half when she must move away from love to redeem the loved one. The irony of the situation is not lost on the narrative. Director Shaad Ali making as triumphant a comeback after the crippling failures of Jhoom Baraabar Jhoom Kill Dill and OK Jaanu as Sandeep Singh after the freak gunshot keeps the narrative straight and uncluttered. He gets fabulous support from his leading man. Diljit Dosanjh makes the character and his struggles look so artless and credible you want to reach into the innards of the plot and hold the protagonist s hand and tell him It s okay. You will be fine. I ve suffered too. In a sequence like the one where Diljit pleads and rages over the phone against his beloved s seeming betrayal. Dilijit s gentle control over the swelling emotions is laudatory. If this performance doesn t fetch Dosanjh a National award what will? Don t look for subtleties in this tale of valour and resilience. In fact some portions for instance the buildup in the train to the gun-shot are purposely constructed in a unvarnished style to impress on us the immediacy and longevity of a saga that goes beyond one individual s ability to make a comeback. If Sandeep Singh was nicknamed Flicker Singh this film takes that flicker into sphere of a burning flame. Soorma just makes you happy for the unsung heroes whom cinema has the power and reach to put on a pedestal.